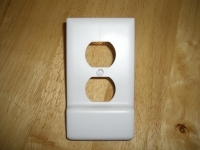 A few months ago we took at look at the SnapPower Guidelight, an electrical outlet coverplate that includes an LED nightlight that does not interfere with the use of either outlet. In this review we have another clever product from SnapPower, this time in the form of their Charger Duplex Outlet Coverplate. As shown in the promotional image below, this device replaces your outlet coverplate and adds a single USB outlet suitable for charging your mobile devices. The SnapPower website doesn't really give you much technical information about the Charger, which does seem odd to me. While on the site, you can see that they are available in Decora and Duplux styles, and that they are available in three colors: white, almond, and ivory. I was looking for information on the power output, as well as the physical size, and for that I had to look elsewhere. What I have found is that the charging port is 1 Amp / 5 Volt, which will be just fine for most phones, but is half of the 2A needed for tablets or fast charging devices. Your 2A rated device could still be charged, but just at a slower rate. Physically, I know these are only available in the standard outlet dimensions, as I do have the Guidelight to compare it to. One of my complaints with the Guidelight is that physically, the coverplate is rather small. Most of the outlets in my home are midsize or larger, which is great for covering imperfections in the drywall around the outlet, and makes painting a wall easier since you don't have to cut in so tight around the outlet. Putting a standard sized coverplate somewhere that had previosuly used a larger plate might look rather unattractive, as you might see things like damage from cutting the opening, remnants of past paint jobs, or edges of wallpaper. 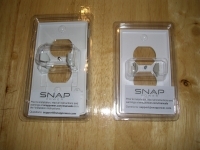 The two images below show the Charger still in its clear packaging, while placed right next to the still packaged Guidelight. You can see that the Charger is a bit taller than the Guidelight, but the same width. 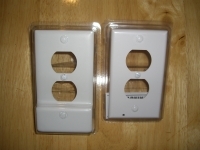 Both products are very similar, as they are just plastic coverplates with springy metal terminals near the middle that will touch screws on either side of your existing outlet in order to pass electricity on to their special features. The Charger is shown by itself in the images below. In the below left image we see the front, which looks like a fairly typical coverplate minus the bulge at that bottom. This area is where the electronics are to convert your 120V AC supply voltage to 5V DC for your mobile devices. The USB outlet is located on the right side of this bulge. The above right image takes a closer look at the back and the two terminals that make the whole thing work. Not visible is that the terminals are not completely white, there is a brass face on each that will make contact with the screw on either side of the outlet. 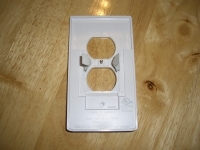 Then, molded in the white plastic are the electrical traces that complete the circuit with the charging portion of the coverplate.